It was during a safari vacation in the early 1970's when Lou Segal made his discovery. He came upon a number of tribes performing rituals and noticed that one particular group had thick, strong, healthy heads of hair. "I found out that this one group applied a mixture of plants, roots & leaves to their heads and their faces and would wait for the moon to come out," the elder Segals explains. "The reason was that they felt that the moon would absorb & cleanse their souls of all the evil spirits through the medium of this earthy botanical mixture. What they did'nt realize was that they were unknowingly giving themselves the best hair & scalp treatment nature has to offer. 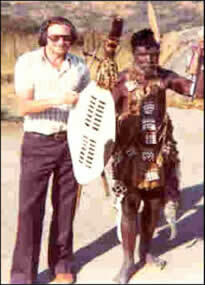 Mr. Segal asked the tribe's chief to give him a sample of the mixture whcih he took back to his laboratory in Cape Town for analysis. He incorpoarted his findings into his scalp formulas, shampoos and conditioners. While the components were all from natural sources, the exact ingredients remain a secret. His new products met with surprising results with many people reporting drastic reductions in hair loss and even new hair growth. But as increasing political uncertainty grew in South Africa, Mr. Segal decided it would be best for his family to leave the country. "I am fortunate to have access to my fathers formula," son Darryl says. "And as a pharmacist, and being fascinated with the results people were receiving from the product for so many years, my life long commitment is to improve on the formula and make it available to as many people as possible.